This page has been established to support the monitoring of coral bleaching in the Indian Ocean. It provides access to resources developed through the support of the Indian Ocean Commission, the Reef Resilience Network, and CORDIO. For the latest alert and observations of coral bleaching in the WIO click here. To report observations of coral bleaching go to the “Report coral bleaching” tab below. Several materials are provided here, available under the tabs below. A basic coral bleaching response plan is described in the webinar below, from the Reef Resilience network (www.reefresilience.org). Note that the sound starts after 1 minute! The presentation below was used in the webinar – view it on slideshare. The approach is simplified from resources such as the Reef Managers Guide to Coral Bleaching, and examples from the Florida Reef Tract and the Great Barrier Reef. Further details on monitoring are provided in the adjacent tabs. CORDIO has implemented a coral bleaching forecast for the Western Indian Ocean since 2009. The illustration at right shows five climatic regions based on variation in sea surface temperatures, varying from hottest/most variable (red) to coolest (green/blue). See the links below for detailed background and methods. 2015 was the hottest year ever recorded, and 2016 promises to be even hotter (see here and here). In addition, both El Nino and Indian Ocean dipole conditions were strongly positive leading up to and at the start of 2016. Coral bleaching has been widespread in the Caribbean and Pacific in late 2015. Coral bleaching in the Western Indian Ocean is expected to be very strong in 2016. 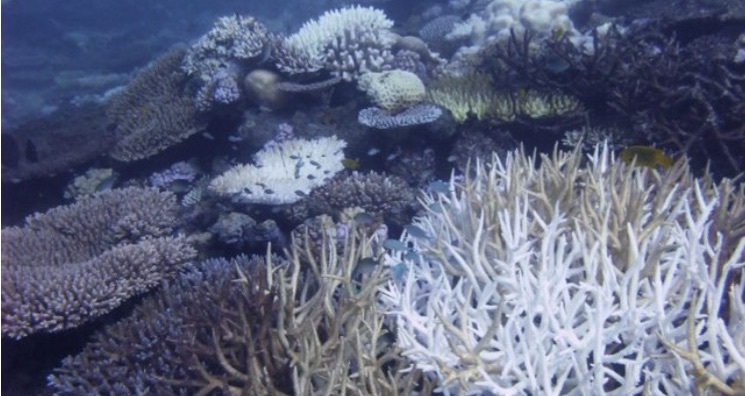 See these videos for a background on coral bleaching. A guide to the most common monitoring techniques used in the region is presented here, in generic classes of 'basic', 'intermediate' and 'high' levels of detail. Most groups accessing this site may use the basic method, so support is oriented around those, but it can also be provided for the higher levels of effort on request. The manual is available in English and French. The methods are summarized in the Bleaching Response Plan provided in the prior tab. For datasheets and guidance on analysis and submission of data go to the next tab. See the publications below for additional guidance no monitoring coral bleaching. Submit basic observations on coral bleaching through the google-form at this link , or in the embedded window below. For intermediate or advanced data (see manual in the previous tab), we will upload further materials, to be available here. This simplified web-form has been set up to assist non-specialists in basic reporting of coral bleaching observations in the Indian Ocean. All data will be submitted to the global bleaching form supported by the NOAA Coral Reef Watch programme, summarized and made accessible on a WIO regional database under development.